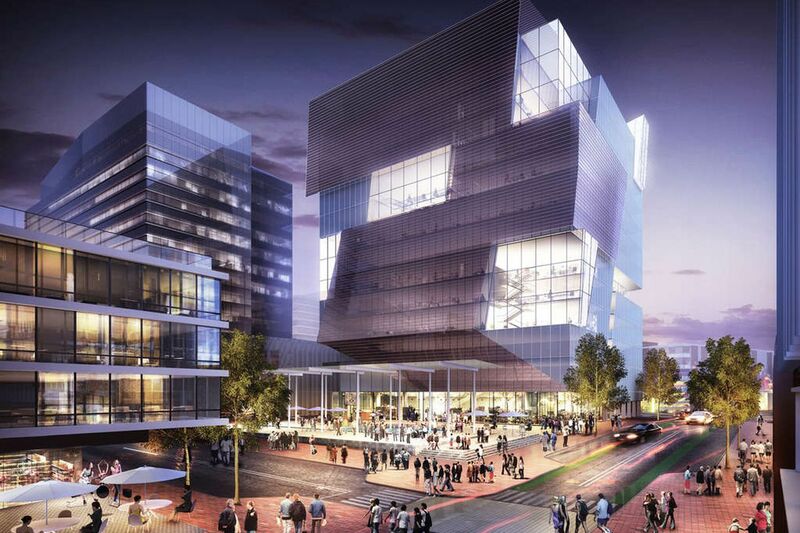 An illustration shows how uCity Square will look when the $1 billion expansion has been completed. Amicus Therapeutics announced on Tuesday it will base its global research center on three floors of the center. Amicus Therapeutics, a growing biopharmaceutical company that focuses on rare and orphan diseases, is committing to Philadelphia in a big way. Citing the city as a burgeoning hub for medical breakthroughs, Amicus will launch a new Global Research and Gene Therapy Center at uCitySquare. A couple of dozen Amicus research employees already have moved into a temporary space in West Philadelphia. They will be joined by 200 new hires — biologists and chemists — when the company’s 75,000-square-foot center opens in late 2019. The new facility will house the headquarters for the global Amicus science organization and the gene therapy leadership team. Amicus will retain its corporate headquarters in Cranbury, N.J.
Crowley’s dramatic and unusual history in biotech was retold in the 2010 movie Extraordinary Measures, which starred Brandon Frasier and Harrison Ford. As a newly minted Harvard MBA, Crowley’s two youngest children were diagnosed as infants with Pompe disease, a rare ailment that ravages muscles and nerve cells. Rather than accept a diagnosis that would have consigned his kids to death at 8 years of age, Crowley — then a financial consultant — launched a company that pioneered enzyme replacement therapy and saved his children’s lives. “It wasn’t a cure, but it improved their muscle strength and kept them alive,” he said. The company on Monday won breakthrough therapy designation from the FDA for its treatment for a late-manifesting form of the disease. The decision will speed development of the drug and helped the company’s stock rise by 7 percent. John Crowley, CEO of Amicus Therapeutics , with his daughter Megan at Notre Dame University. Amicus will be the flagship tenant of the new uCitySquare building at 3675 Market St., where it will occupy three floors. The company went public in 2007. From an initial staff of five, it now employs 600 people with international offices near London and in Tokyo. It has contract manufacturing plants in Switzerland, Ireland and China. Biotech has set down deep roots in University City in recent years. Spark Therapeutics, the gene therapy pioneer founded by researchers from Children’s Hospital of Philadelphia, agreed to be sold on Monday to Roche Holding AG of Switzerland for $4.3 billion. Invisible Sentinel was acquired by France’s bioMérieux last week for $75 million. Invisible Sentinel is the Science Center incubator start-up that produces DNA tools to detect pathogens and spoilage organisms in food and beverage. Avid Radiopharmaceutics, a West Philly diagnostics company that detects amyloid plaques associated with Alzheimer’s disease, was acquired by Eli Lilly in 2010 for $800 million. All of the companies intend to remain in West Philly as stand-alone divisions of bigger corporations, said Saul Behar, senior vice president of advancement and strategic initiatives at the University City Science Center. Amicus will be investigating gene therapy cures for Pompe disease and 14 other lethal diseases. If the company is successful, Amicus won’t have to make enzymes in big bioreactors with Chinese hamster ovary cells. Patients won’t have to be hooked up to an IV machine every other week. His daughter Megan was diagnosed with Pompe disease when she was 15 months old. His son, Patrick, when he was only seven days. The Crowley kids, and several thousand other children, have benefited from the enzyme therapy. Though still in a wheelchair and breathing through the aid of a ventilator, Megan is graduating from Notre Dame in May and plans to become a social worker. In November, as Crowley was negotiating the deal with uCitySquare, he took Patrick to the Philadelphia Zoo. “We used to take him all the time when he was a little boy. He loved to look at the gorillas,” Crowley said. "It was a beautiful late fall day. After we took him over to Market Street and showed him the building.